The authors story of how they adopted, tamed, and trained BLM wild horses (mustangs). Sections on horse color genetics, adopter information, horse training, and horse training videos. The largest group of dedicated Ford Mustang lovers in Central Kentucky, charter members of the Mustang Club of America and the Mustang Museum. Official site of the Institute of Range and the American Mustang, and the Black Hills Wild Horse Sanctuary, a non-profit organization founded in 1988 dedicated to giving the wild mustang back to the open range. Includes information on organizations, fundraising, newsletter, volunteer programs, and visiting. Offers foals for sale. Photos and specifications on a pampered 97 Mustang GT. Links to Mustang club and enthusiasts sites. Dedicated to the preservation of the Mustang experience for all years of the Ford Mustang. Description of building a Mustang II experimental airplane. Numerous photos, performance information and downloadable files to make a flight manual. Links to other Mustang and aviation sites. Information on The 1978 Mustang II Ghia, Pictures, Specs and Links to other Mustang II Pages. An online community for the Mustang drag racing enthusiast. Site offers the latest Mustang drag racing news, tech articles, driver interviews and an active forum area. Offers photos, specifications, and forums about the 1967 Ford Mustang. Web ring started in October of 1996, to promote Mustang web sites and their authors. Offers reviews, news, parts information, and links to other Mustang sites. Information on Mustang horses, their history, and photos. Located in Montana. An email discussion group for fanciers of the Mustang horse. Information on how to join, and public message archives. Pictures and information of Dans latest restoration project of a 1964 Mustang Coupe. Journal of mods and performance tweaks on the owners 1991 Mustang 5.0L, with photos. Pictures, sounds, dyno results and the story of a 505 rear wheel horsepower Mustang. Membership open to all persons age 16 years or older interested in Mustang automobiles. Located in Cocoa, FL. Non-profit organization committed to the preservation of the Classic Mustang. Club information and event schedule are included. 1964.5-1966 Ford Mustang registry, plus boards for reviews of reproduction parts, general messages and classifieds. The story of Craigs 1993 S-Trim Vortech Mustang LX 5.0, plus tech articles and related links. Created for the preservation and love of the Mustang. Includes events, newsletter, album, classifieds and membership details. Regional chapter of MCA. For all years of Mustang and Special Interest Fords. Ownership not required to join. Members hail from Idaho, Oregon, Washington, Utah, and Montana. An umbrella registry for all Colonial Spanish Horses. The HOA accepts horses from the Spanish Mustang Registry, the American Indian Horse Registry, and other strains identified as Colonial Spanish. Formed in 1998 to collect, record and preserve the pedigrees of American Mustang Horses. Human edited wiki providing specifications and resources for the Ford Mustang II, produced from 1974 through 1978. A group of Mustang enthusiasts. Club news and photo galleries. All model years are recognized. Detailed listing of modifications performed on a 1995 Mustang GT project car. Dedicated to late-model 5.0 performance. If the business hours of Adopters Story: Our Wild Mustangs in may vary on holidays like Valentine’s Day, Washington’s Birthday, St. Patrick’s Day, Easter, Easter eve and Mother’s day. We display standard opening hours and price ranges in our profile site. 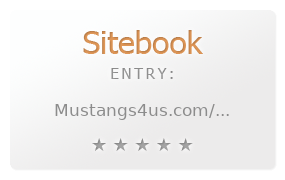 We recommend to check out mustangs4us.com/ for further information. You can also search for Alternatives for mustangs4us.com/ on our Review Site Sitebook.org All trademarks are the property of their respective owners. If we should delete this entry, please send us a short E-Mail.